It's fall in central PA. The leaves are looking beautiful and apples and pumpkins are everywhere! My host family took advantage of one more warm day and we headed to the fruit farm Pumpkin Festival this weekend. Everyone knows my "little brother" and I have a very special bond. He was almost seven months old when I moved in with them. I've watched him learn to crawl and walk! When I come over, he's at the window screaming "HEATHEY!!!!!" I love him more than I knew it was possible to love a human being! 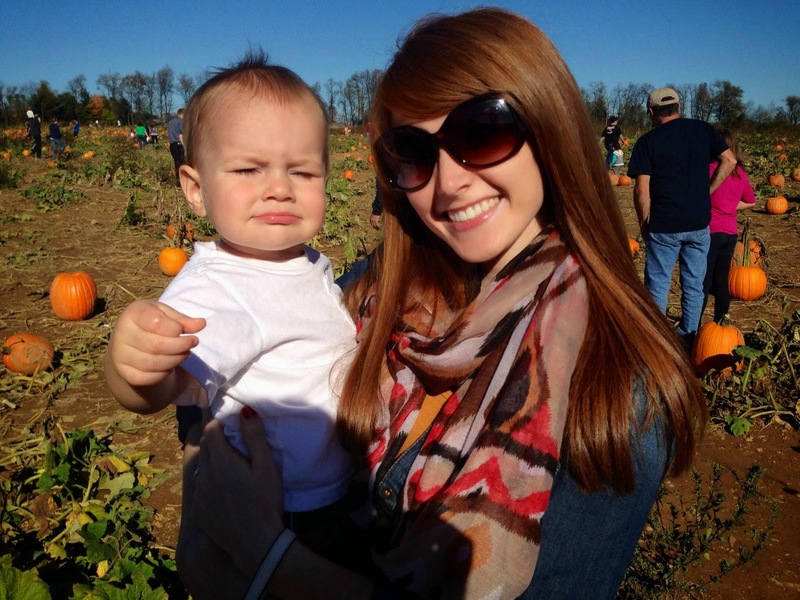 Naturally, at the pumpkin patch, he was my buddy. We rode the tractor out to the patch and he wanted to get down and look around. We walked through the patch as he pointed to the big, round, orange things and said, "ball." Then he zeroed in on the one. Boo had to have this pumpkin. Nothing was going to stop him. Nearly as big as he is, the sweet darling attempted to pick it up. This is called the "bear hug" approach. You bend over, wrap your arms around it and yell "UP!" This method didn't work. After one failed attempt, he decided on a new method. Allowing me to help him was not an option. This is the "squat." You try to lift more with your legs... After numerous attempts, this still did not work. He is not appreciating the fact that I'm dying with laughter. It was so adorable to watch! He tried this on his own for about five minutes before he allowed me to finally assist. All I did was roll the pumpkin over and point out that it has a stem. I pointed to it and said "Lift here." It was still no small effort, but he adjusted his grip, stuck his tongue out and lifted the pumpkin off the ground. He did it! Could he have really done it on his own? Maybe. But he would run a much greater risk of being injured. Let me tell you - before he allowed my help, he was growing frustrated and angry... my laughter and photography were not helping. And yet, the sense of pride and accomplishment he had when he picked it up! I cheered for him. 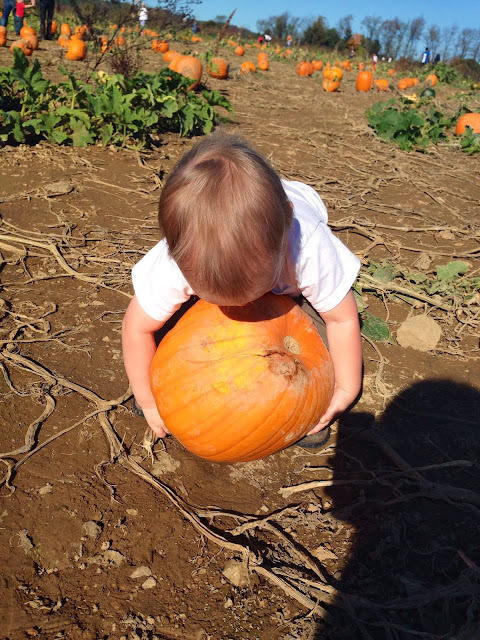 He dropped the pumpkin back down on the ground. He took my hand and looked up at me, "Heathey, up," as he pointed to the pumpkin. I was thankful he consented to letting me carry it out of the patch. I'm sure by now many of you already know where I'm going with this in a spiritual sense. Yes, those things in life we think we can carry on our own. The burden, the struggle, the sin, the temptation, the brokenness. We really and truly think we can carry it by ourselves. I've tried. 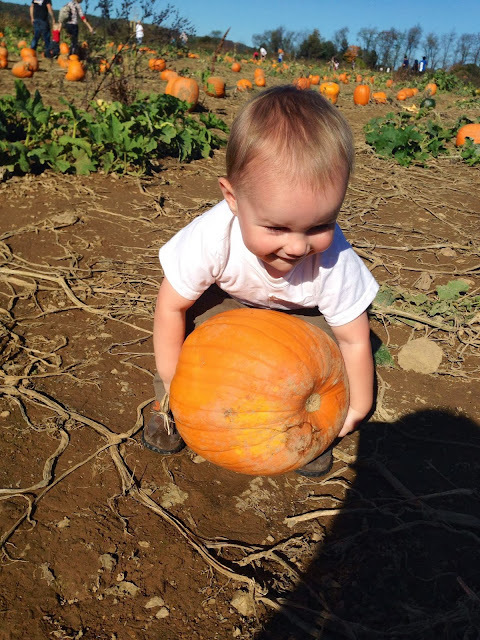 I have tried for the last three years to carry my "pumpkin" on my own. The truth is, I can't pick it up. I'm sure the Lord found it highly amusing to watch. He probably looked on with His camera. "Awww how cute! She thinks she can really do this!" [Snap embarrassing picture]. "Do you want me to help you, Heather?" I simply gave the same grunt Boo gave me and slapped His hand away. We were not meant to carry "pumpkins" on our own. We are to let Him carry our burdens and allow others to come along side and shoulder some of the weight as well. I'm not sure who I've been trying to fool or what I've been trying to prove. In the last month and a half, I have finally realized my inability to carry (or even lift) my pumpkin alone. Family. Friends. Fellowship. There is a purpose to it. It's to help you. Allow the lift. I'm sure you look as adorable as my little brother trying to figure it out by yourself... Let Him come show you a better way. Let someone else hold it for a while. Faith sometimes means admitting to feeling. It is ok as a Christian to feel. I've denied myself the ability to feel anything (positive or negative) for far too long for fear that someone might think less of me if I showed my true level of strength. I was great at faking it. I could put on my "muscle suit" to go out in public, but behind closed doors, those muscles were nothing more than well-placed padding. God designed us for community. To fulfill the law of Christ He asks us to carry each other's burdens. That also means you must be willing to allow that to happen. 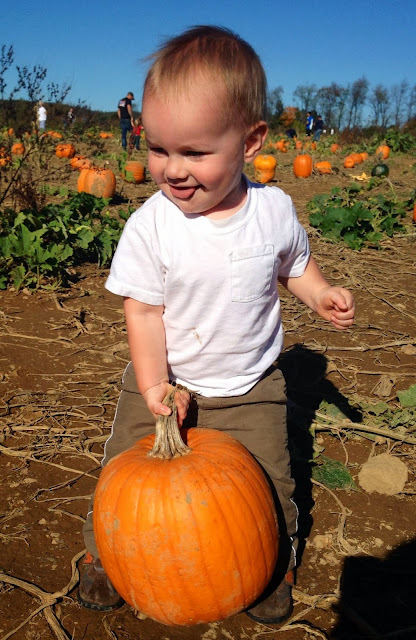 Yes, you can learn about faith, freedom and fellowship in the pumpkin patch.